Residents who use St Peter’s and North Laine Medical Centres are set to benefit from a brand new purpose built surgery under plans to merge the practices, which came a step closer with a council proposal to lease land to enable the development. 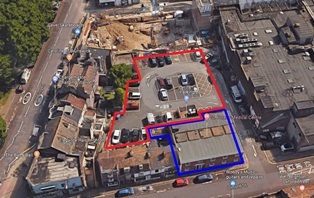 Brighton & Hove City Council has approved a proposal by the owner of St Peter’s Medical Centre to purchase a long lease of the Oxford Street car park to re-develop and expand the existing health centre that adjoins the site. The development will provide modern, fit for purpose and integrated primary care premises, serving more than 16,000 local patients. The plan is for both St Peter’s Medical Centre and North Laine Medical Centre practices to merge into the new premises which will continue to operate throughout the redevelopment. Brighton & Hove City Council has been working closely with partners, including NHS Brighton and Hove Clinical Commissioning Group (CCG), Sussex Partnership NHS trust and Sussex Community NHS Foundation Trust to deliver estates developments for modern premises. Building on the recent proposals at Preston Barracks and 62/63 Old Steine the centre will include the integration of community mental health services from the site. Brighton and Hove CCG has secured capital of £1.24m from the Estate and Technology Transformation Fund towards the project. Dr David Supple, Clinical Chair of the CCG, said: “We have been notified by the partners at St Peter's Medical Centre and North Laine Medical Centre of their plans to come together to form a single larger practice with operating out of brand-new, purpose-built premises, offering the surgery greater stability and sustainability for the future. “Both practices are currently sited in premises that are considered unfit for purpose, and the new single larger practice will be co-located with a local NHS trust, which will offer opportunities for more integrated health services to be provided closer to people’s homes. “There is no need for patients registered at either surgery to do anything to get a new GP; they will be automatically taken care of as part of the joining together process. Oxford Street is a small pay and display car park with 36 spaces. There will be some parking spaces, including disabled bays, for users of the new centre, and capacity in the nearby London Road car park. Twenty six bus routes stop within 100metres of the existing surgery. Work is set to start in March next year with completion in 2020. A new healthcare centre is also being created as part of the Preston Barracks regeneration scheme. Brighton & Hove City Council is working with developers U+I, the University of Brighton and NHS Brighton & Hove Clinical Commissioning Group (BHCGG), to provide the new primary healthcare centre. The centre will incorporate and extend two existing GP practices providing medical services under the NHS, alongside a range of community based health and social care services.